The 2016 Chardonnay Ma Belle Fille slowly unfurls in the glass to reveal vibrant key lime pie, lemongrass, pink grapefruit and white peaches scents with suggestions of crushed stones, clotted cream, almond croissant and orange blossoms. Medium to full-bodied and with a fantastic intensity of citrus and stone fruit layers giving way to loads of mineral accents, it finishes long and creamy. 1,650 cases produced. The 2016 Chardonnay Ma Belle Fille has a compelling salted nuts and honeyed cake nose with a core of orange peel, pink grapefruit and rising bread dough. Medium-bodied, elegant and with great intensity, it has a wonderful yeasty/toasty character coupled with the gregarious citrus notes, finishing long and layered. To be bottled in February 2018; 1,700 cases are expected. The oldest Chardonnay vineyard Peter Michael uses is Belle Cote. The 2014 Chardonnay Belle Cote, from old Wente clones of Chardonnay planted in 1990, shows notes of creme brulee, orange marmalade, crushed rock and white peach. It has stunning richness, full-bodied intensity, and a long, long finish. 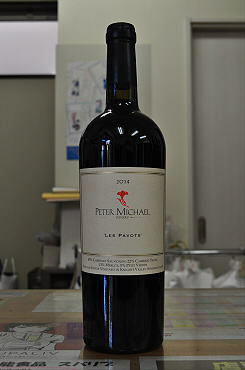 The 2014 Proprietary Red Les Pavots (3,570 cases) is a blend of 60% Cabernet Sauvignon, 20% Cabernet Franc, 13% Merlot and 5% Petit Verdot aged in mostly Taransaud barrels with a small helping of Darnajou thrown in. This wine is fabulous in the vintage, although certainly less profoundly concentrated and extracted, as well as structured, compared to the 2013, which was off-the-charts fabulous. This is a brilliant wine, charming, with front-end loaded plum, blackcurrant and black raspberry fruit interwoven with graphite, tar and truffle notes. The wine has sumptuous texture, sweet, velvety tannin, and a long, full-bodied finish. It should drink well for at least two decades. The 2013 Cabernet Sauvignon Les Pavots, which is their proprietary red wine blend from Knights Valley, is a killer effort, and one of their all-time greats, ranking right up there with the 2007 or 1997. A blend of 69% Cabernet Sauvignon, 21% Cabernet Franc and the rest Merlot and Petit Verdot, there are 3,600 cases of it. The wine displays plenty of mocha, chocolate, blackberry, creosote and charcoal in an incredibly complex fragrance. Full-bodied and opulent, it shows, loads of tannin, a hint of unsmoked cigar tobacco and plenty of black and blue fruits. Opaque purple to the rim, this wine is in need of a good 5-6 years of cellaring and certainly has 30-40 years of life in it.